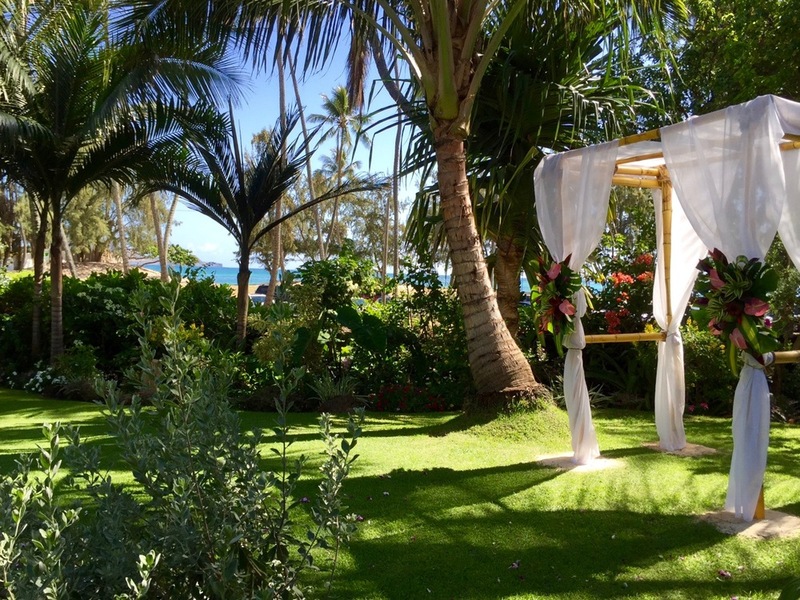 Male’ana Gardens is a one-half acre property, located just steps from Kailua Beach. The property is close to the beach and yet, still remains secluded, quiet and peaceful. The two-year renovation of the gardens continued to develop and nurture the 3,000 plants and trees surrounding the lush rolling lawns. Nestled in the lush gardens, shaded by Coconut Palm, fragrant Plumeria and delicate Shower trees, the 12’ by 20’ cabana is adorned with three crystal chandeliers and overlooks the turquoise water of Kailua Bay. The Enchanting Bungalow is 1,000. sq. ft and is included in the wedding package during the wedding / reception. It is decorated beautifully with original artwork, high-end furnishings and attention to detail. It may also be rented for the honeymoon night.